- Publisher In the style of the best-selling book Kids' Travel Guide to the 10 Commandments, these 13 lessons take children from Kindergarten to fifth grade on a life-impacting adventure into the fruits of the Spirit of Galatians 5: 22-23. The travel theme captures the hearts and imaginations of children, engaging them with activates, stories, prayer, and much more. Children will learn all about the fruit and how to live by the fruit of the Spirit through these power-packed lessons. 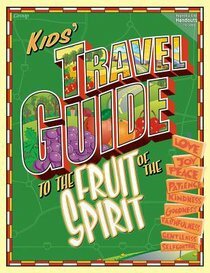 About "Kids' Travel Guide to the Fruit of the Spirit"
In the style of the best-selling book Kids' Travel Guide to the 10 Commandments, these 13 lessons take children from Kindergarten to fifth grade on a life-impacting adventure into the fruits of the Spirit of Galatians 5: 22-23. The travel theme captures the hearts and imaginations of children, engaging them with activates, stories, prayer, and much more. Children will learn all about the fruit and how to live by the fruit of the Spirit through these power-packed lessons.